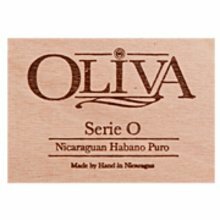 In the last decade, Oliva has become a name in the industry renowned for creating top-quality Nicaraguan cigars. From start to finish, heaps of dark chocolate, black pepper, leather, and creamy coffee notes will continue pleasing your palate. Try the Serie O Robusto today and start making ample room for this box of 24 in your humidor! Good stick I liked the consistent flavor not a flavor bomb but good taste I would smoke it again. This is the one I grab when I can't decide. They're the best "all arounders" I've found. Flavorful but not overpowering, reasonably priced (buy on auction) with a good construction and draw. They do improve with some time in "the box". Enjoy! Great draw. Great ash. Really enjoyable cigar. Medium to mild cigar with woodsy taste with a bit of sweetness. Aged the cigar for several months. The cigar had smooth dry cocoa and dark chocolate flavor that was followed by hints of a woodsy afterwards. Great cigar to have in your collection. Cant go wrong with Oliva. Always well made with excellent flavor. Like the Robustos in this series. 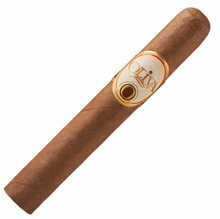 Another amazing cigar from Oliva. I've also tried the Oliva V and mich prefer this on taste and price point. This is my favorite everyday smoke. Smooth, consistent and flavor for days and days. Whether with breakfast or dinner. Have found then to be dried out, 6 days to delivered in PA didn’t help! Wouldn’t order again! 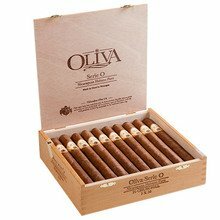 The best of the Oliva "O" Series. Everyone should try this one. The robusto is the best of the O series in my opinion. Been smoking for many years. The aroma and taste will hit the spot every time. Beautifully made with a taste that that is out of this world. This is on the medium+ side for me, I love it just like all the other Olivas. If you haven't tried the Maduro, do yourself a favor and get one. They are both good. The Ohhh is a great smoke. 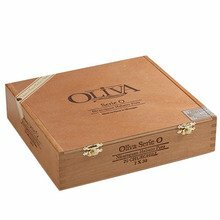 Oliva is a great brand that does not disappoint even a seasoned smoker. I personally hated this cigar. Couldn't finish it. Made it about half way. Very little smoke, a very spicy flavor with a wired floral undertone. All around great cigar. Mild to medium, very consistent contruction.